Last summer (2017) I produced this short film for National Geographic, with the Pulitzer Center on Crisis Reporting, about the rise in exotic pet ownership in China. It’s a subject that is little covered but is crucial to understand, as the industry plays a significant role in the global trade in wildlife. 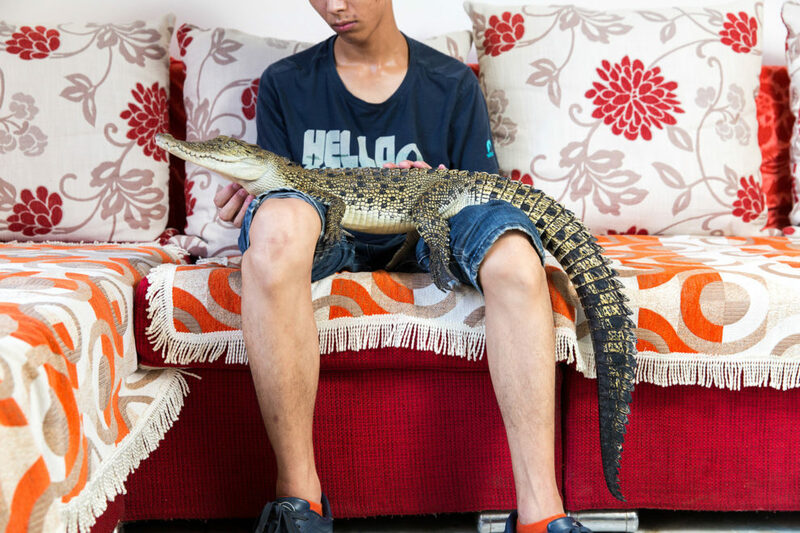 Shao Jian Feng, 26, holds a Saltwater Crocodile (Crocodylus porosus) in his home on the outskirts of Beijing. This juvenile is only two and half years old, but when fully grown can reach up to six metres, making it the largest reptile in the world. It's just one of five crocodilians he owns, along with two other large snakes. "There are twenty three crocodilian species in the world. We hope to collect all of them", he boasts. A Saltwater Crocodile can retail for up to 9000RMB (US$1500). In the wild, they can be found mainly in South East Asia and Northern Australia. 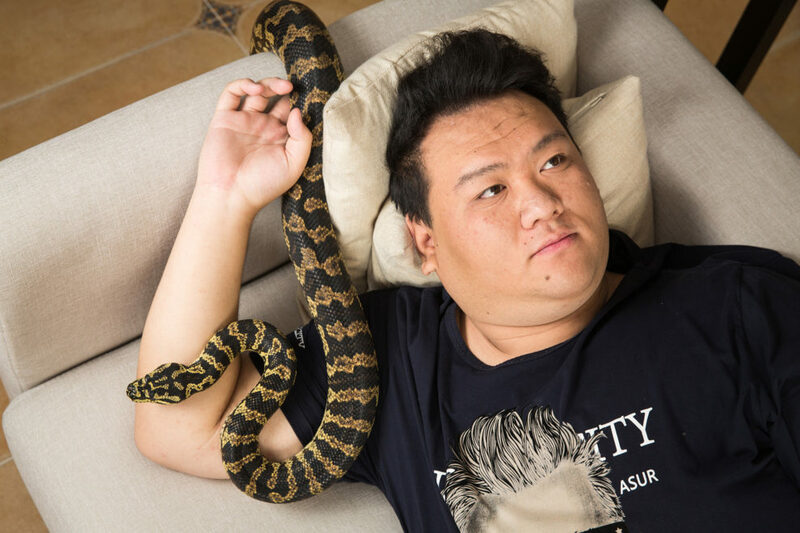 Huang Jiachen, 20, a snake collector and exotic species breeder with his pet python at home in Beijing. Huang set up a breeding farm for exotic species after collecting animals as a hobby and sells animals to China's pet markets. He also collects snakes from across the world, with a particular interest in vipers and pythons. 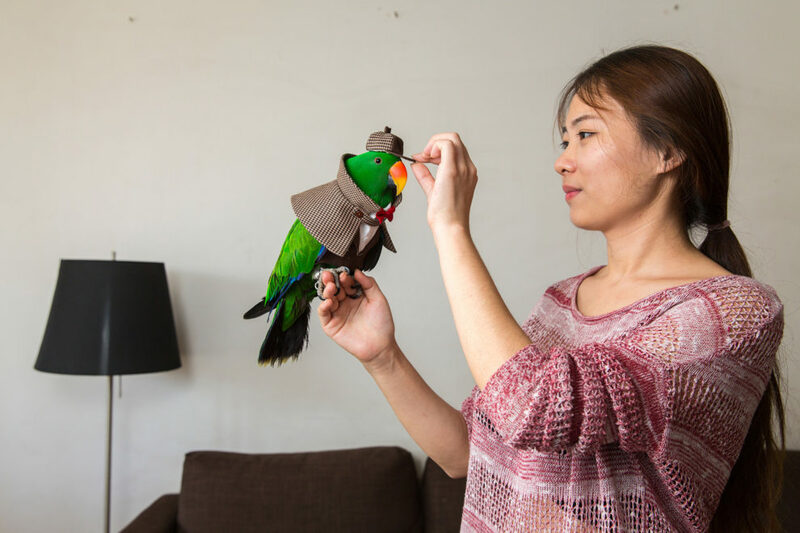 Ms. Yang, 27, places a hat on her pet Eclectus parrot. Quitting her day job in the media industry, she started a company making and selling costumes for parrots. She sells the outfits online to a growing market of pet owners. The Ecletus parrot is originally found in countries including Australia, the Solomon Islands and New Guinea. Recent new laws in China have made it increasingly difficult for people to own birds as pets. Many species, including parrots, are now deemed illegal. 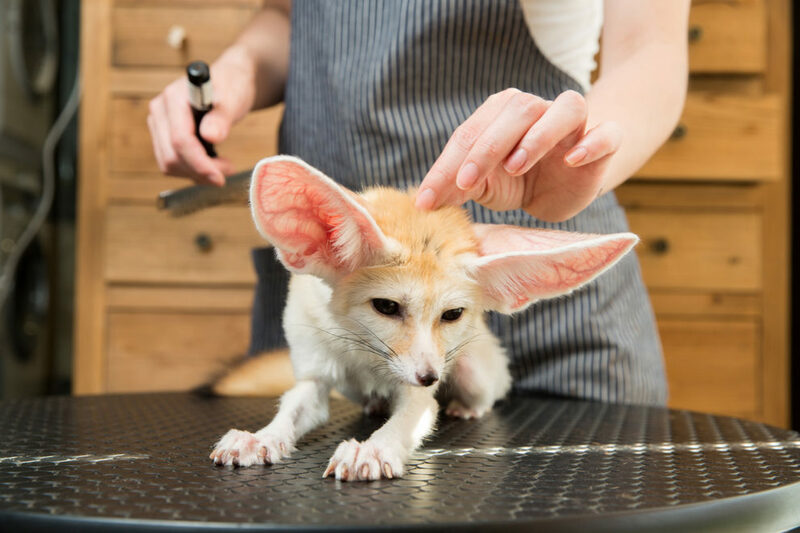 A Fennec Fox (Vulpes zerda) is groomed in a pet store in central Beijing. Native to the Sahara Desert of North Africa, the species became a popular pet for the country's children after being depicted as a character in Disney's 2016 animated movies Zootopia. Individuals can cost between US$2000-3000. Lu Tingting, 32, owns and runs a pet store in central Beijing where she keeps her 3 month old pet raccoon (Procyon lotor), an animal that is native to North America. Having started her shop with friends, she caters to a growing number of young Chinese who look for pet grooming services for their traditional and non-traditional pets. 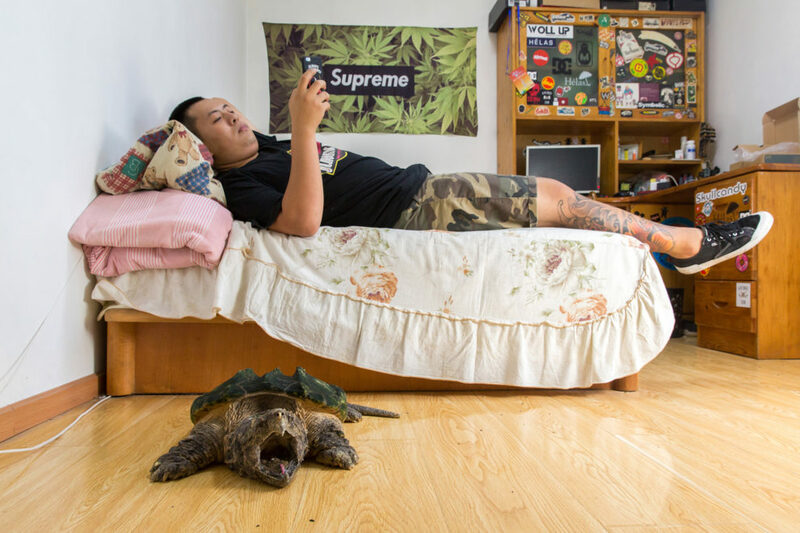 Liu Zhaobei, 25, lies in his bedroom with an alligator snapping turtle (Macrochelys temminckii ). Listed by the IUCN as 'vulnerable' in the wild, the species is typically found in the southeastern states of the United States. Liu began collecting animals in his childhood and now has over thirty different frogs, three alligator snapping turtles and numerous snakes and turtles. "It's obvious it [collecting exotic pets] is becoming more popular. Even at my university there are more course about breeding exotic pets." 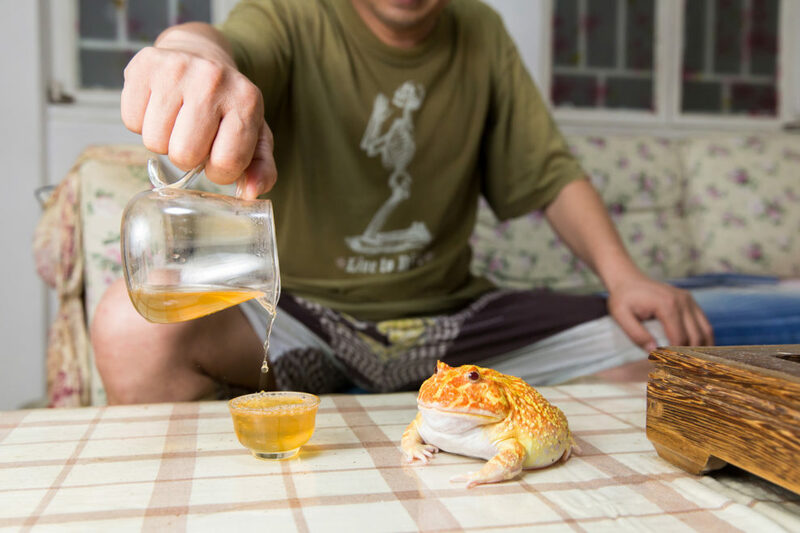 Liu Feng, 53, pours tea next to one of his son's pet Cranwell Horned Frogs (Ceratophrys cranwelli). Native to the South American countries of Brazil, Argentina, Bolivia and Paraguay the frog is a popular species amongst collectors due to its resemblance to the computer game character Pac Man. It's one of 30 different frogs that he and his son keep in their small apartment in central Beijing. Zhang Bo, 36, sits with a Mexican blood tarantula (Aphonopelma chalcodes) in the Guanyuan pet market in Beijing. The species is typically found in the deserts of Arizona in the United States and parts of Mexico. Zhang began collecting spiders in 2007 and then started selling them in 2014 through his shop in Beijing. He collects spiders during trips to South and Central America, selling them in his shop to a growing number of arachnid collectors. Mao Yueying, 27, with her pet 'Sugar Gilder' at home in Beijing. The nocturnal gliding possum (Petaurus breviceps) is typically found in the forests of Australia, Indonesia and New Guinea but has become a very popular pet in China due to its small size and unique appearance. Ms. Mao keeps three Sugar Gliders at home with the most expensive white individual costing 4000RMB (US$600 approx.). 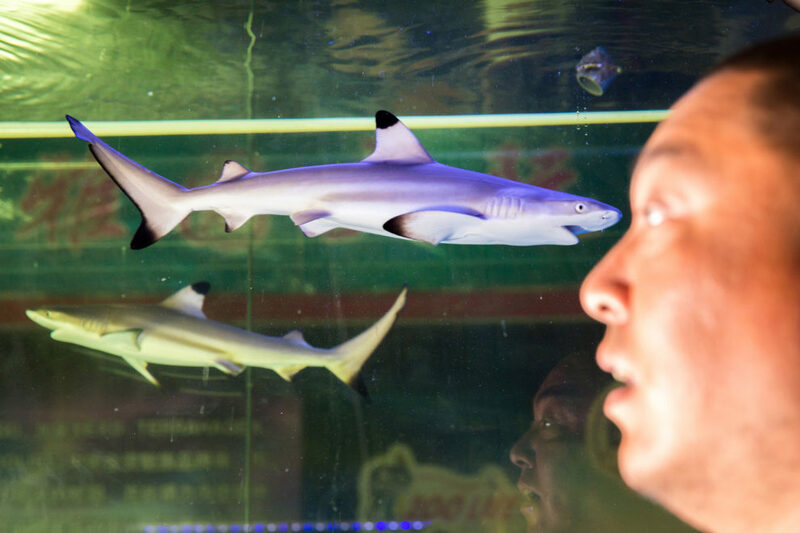 Jian Wei, 38, stands in front of a large tank containing Black Tip Reef Sharks (Carcharhinus melanopterus) in his shop at the Shilihe pet market in Beijing. He sells 3-5 individuals each month with each selling for approximately 4000RMB (US$600). The species is native to the coastal waters of the Info-Pacific region and is listed as 'near threatened' by the IUCN Red list due to overfishing. Jian orders his online from the Philippines and Indonesia with most being sent to China by air freight. 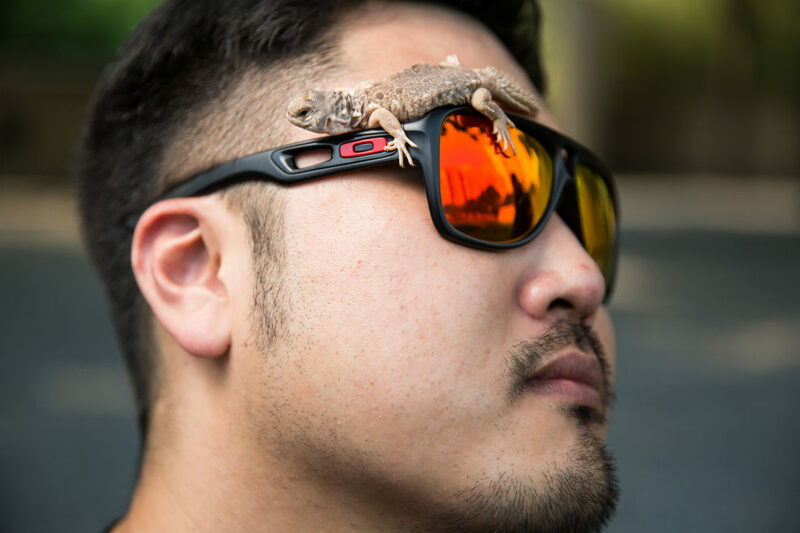 Wei Zheng, 31, with his Princely Spiny-tailed lizard (Uromastyx princeps), a species that is typically found on the Horn of Africa. Numerous species in the Uromastyx genus are listed as threatened and vulnerable on the IUCN Red List. 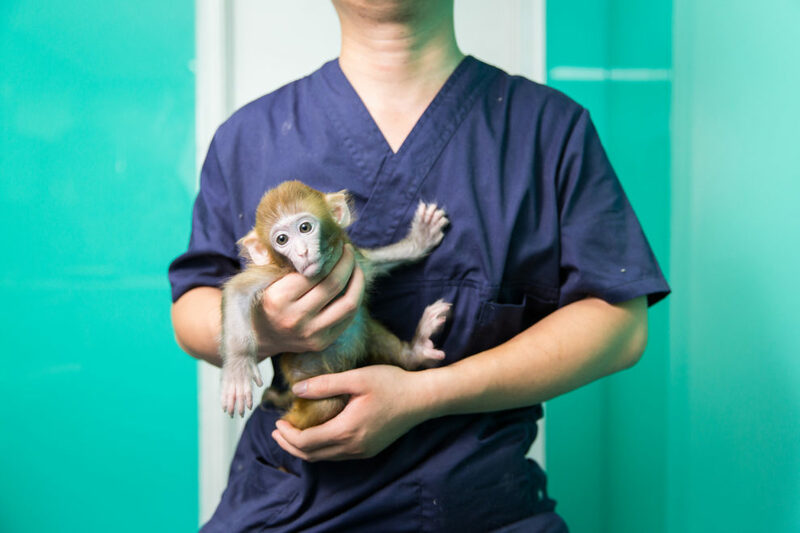 A veterinarian holds a Rhesus Macaque (Macaca mulatta) in a store in central Beijing. It has become increasingly difficult for people to own monkeys as pets in China with laws making it illegal for most species. This does not stop many, especially young people, who see moneys as unique exotic pets that make them stand out amongst their peers. The Rhesus Macaque is mainly found in South East Asia. 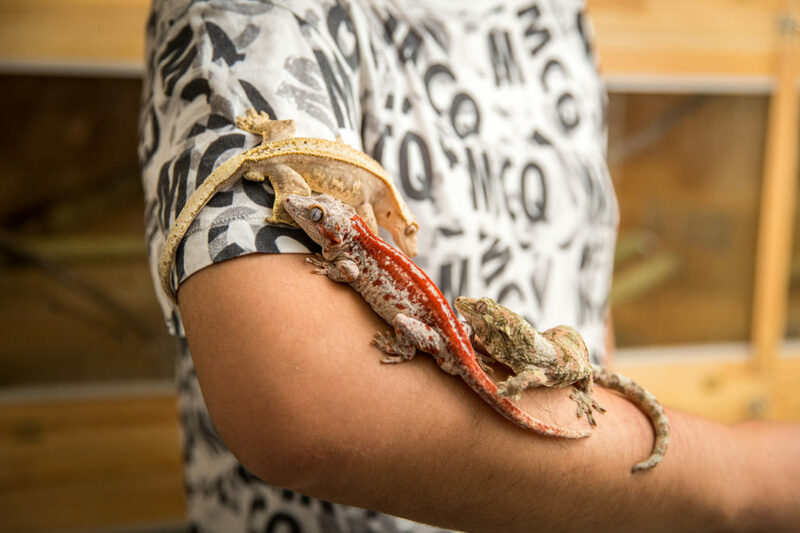 Wang Ke, 30, in his breeding farm with a red striped gargoyle gecko (Rhacodactylus auriculatus), a pinstripe crested gecko, and a mossy New Caledonian gecko (Mniarogekko chahoua). These geckos are only found in the forests of New Caledonia in the South Pacific with many listed as vulnerable due to pressures from human activities including logging, wildfires and forest clearance, and wildlife trafficking. It is estimated that up to one million people own exotic pets in China. These pets are defined as non-traditional ones, such as snakes, monkeys, crocodiles, spiders, and tropical birds that are sourced from threatened ecosystems across the world, mainly to be displayed in the homes of China’s expanding and more affluent middle classes. As this sector of society continues to grow, the rise in pet ownership has risen sharply and many young Chinese are now turning to exotic pet ownership as a way to display their individuality and wealth. The trade in these animals has been directly linked to species loss in some of the world’s most threatened ecosystems, as well as contributing to a rapid rise in invasive species. The global illegal wildlife trade is estimated to generate hundred of millions of dollars annually, although exact figures are hard to come by. What is known is that the trafficking of animals is seeing a global spike in occurrence, leading to many species becoming increasingly threatened and significantly contributing to the current worldwide biodiversity extinction crisis. Due to the scale of exotic pet ownership in China, it is a significant environmental issue as more affluent consumers turn to these types of animals as pets, fuelling the destruction and damage to ecosystems across the world.